Equitas Bank, the first private sector bank from Tamil Nadu post-Independence announced the launch of its new loyalty program ‘Equinox’exclusively for its customers with an aim to imbibe digital payment habit in them and at the same time provide with one stop shop solution for all their spending needs. The bank has tied-up with Visa, the global leader in payments technology to introduce four variants of debit cards: Visa Signature, Visa Platinum, Visa Gold and Visa Classic (more details below) with each having different feature and reward system. Depending on the card variant, the bank customers can now avail the benefits on select swipes apart from subscription to customized offers across various categories. Besides, they can also enjoy the benefits of their respective card while transacting through internet banking, net banking and using other new-age payment channels. “Since inception, we have always believed in providing a unique experience to our esteemed customers and creating a different eco-system. Our current move also coincides with the country’s drive for digitization. We certainly believe that our efforts will lead to customers moving to cashless transactions and thereby contributing to India’s journey and transformation towards a digital economy,” he further added. All Equitas Bank customers are auto-enrolled in Equinox which entitles them withreal-time discount coupons of leading brands besides having a dedicated marketplace for various online bookings, right from recharge, hotel, movie and flight bookings. Equinox Points can be redeemed across a vast catalogue of products and booking services. Equinox also allows customers to earn at an accelerated rate by transaction at various partner merchants. Apparel - Lifestyle : 2X points, ColorPlus : 4X Points ; Jewellers - Kalyan Jewellers : 2X Points , Malabar Jewellers : 2X Points ; and other partners like Blackberry’s : 3X points , 1mg : 20X Points , PUMA : 4X Points , Monginis :5X points and many more merchants across India. Not only customers can earn accelerated rewards at select merchants but also redeem their points at these merchant outlets, thus giving an ahaa experience by giving instant discount on the billing equivalent to the points redeemed. Exclusive hotel, travel related discounts. 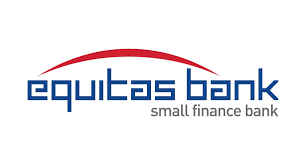 Equitas Small Finance Bank Limited is a Small Finance Bank (SFB), licensed by Reserve Bank of India under Section 22 of the Banking Regulation Act, 1949 to carry on the business of Small Finance Bank. The Bank has commenced the business of SFB on September 5, 2016. It is the first Private Sector Bank from Tamil Nadu to commence operations post Indian Independence. ESFBL was formed by the Merger of two wholly owned subsidiaries of EHL viz., Equitas Micro Finance Limited [EMFL] and Equitas Housing Finance Limited [EHFL] with Equitas Finance Limited [EFL]. ESFBL, with pan India operations, is focused on providing financing solutions for individuals and micro and small enterprises (MSEs) that are underserved by formal financing channels while providing a comprehensive banking and digital platform for all. True to its tag line – “Its Fun Banking ”, the bank offers customized savings products with a focus towards giving children, youth, families and entrepreneurs across India, a new and a fun way to bank. By Q1FY18, ESFBL plans to roll out the entire network of 412 bank branches spread across 13 States in India. Of these 412 branches, 50% will be in South, 30% in West and the remaining 20% in North. About 25 per cent of the bank branches will be located in rural, unbanked villages. Currently, the bank has an AUM of around Rs.7,181 Cr, of which about 49% is contributed by Micro Finance, 26% by Used Commercial Vehicle Finance and the remaining 24% by MSE and affordable Housing Finance.